The U.S. is my home. I was raised in this country, and it is all I know. I have lived in America since I was only one-year old. My siblings, both older than me, would take care of me in the afternoon when my parents would get out of work and go on to their second job, which was cleaning offices at night. Both of my parents worked as hard and as often as they could just to make sure that we had what they didn’t. I often saw and still see my parents breaking their backs in order to get by. My family is always afraid of being pulled over and we continuously live with that fear. However, my family and I also see the U.S. as a home which provides us with opportunities. I found out I was undocumented at the age of eight. I had told my mom I wanted to be a Disney Star and that I had received an interview. Soon after, she broke the news to me that I wasn’t able to work because I wasn’t a citizen and I wasn’t even able to travel. As a young child who had never spoken a word of English, I had issues in school at first. In kindergarten, I remember not being able to spell the word “girl” and not even knowing what “girl” meant. But soon after, I started performing progressively better school and started speaking and learning the language. Throughout my childhood, most teachers were supportive and pushed me to be better. I thank my teachers because they gave me hope that I didn’t always see within myself. Now, I want to encourage people to become civically engaged and I want to eventually practice law and help out the immigrant community in some capacity. 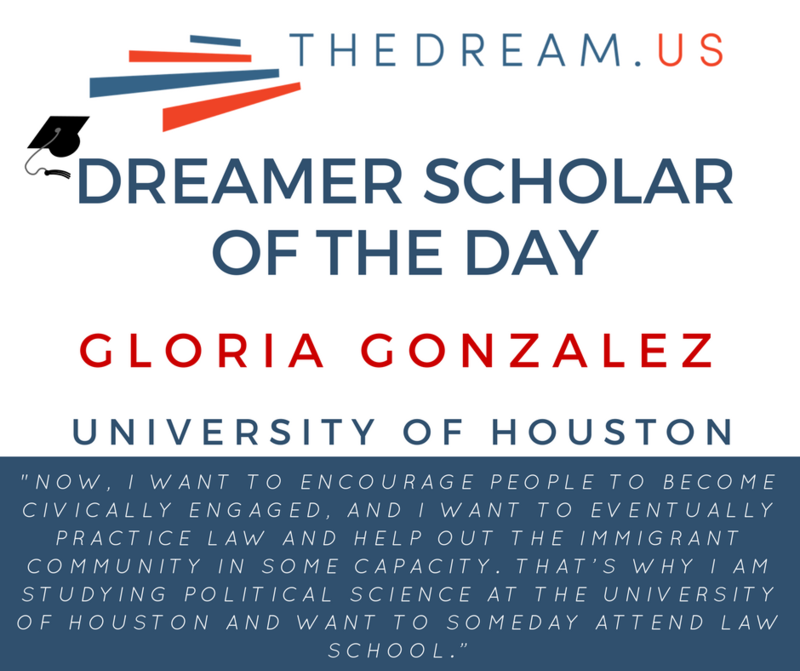 That’s why I am studying political science at the University of Houston and want to someday attend law school. Higher education access for DREAMers is important and good for our society. DACA has lifted a burden from my shoulders and has made me feel safer. It has allowed me to get a job and also to go to school. Without DACA I wouldn’t have a way to pay my bills and I would have to be afraid once again.